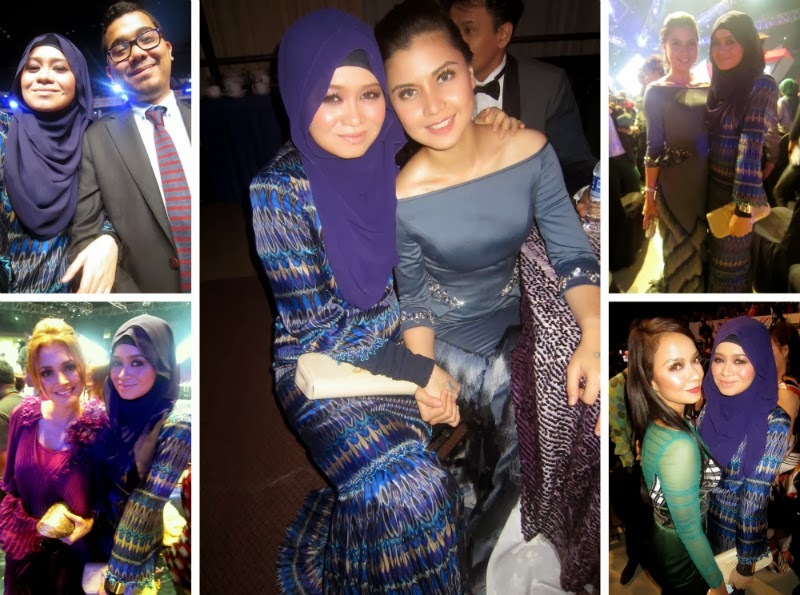 On 10th April 2013, I blogged about what I wore and the story on why I was at ABP BH 2012 : Part 1 which I attended on 7th April 2013. This is a very much delayed post, but here are the many many photos of the lovely people I met and the story behind the unexpected event that I attended. I have a confession to make. I've never actually watched the ABP shows on TV, so I didn't know what to expect, but it was really interesting being in the shoes of a Malaysian actress attending the award ceremony for a night. Actually, we were just representing my cousins and had their VIP celebrity passes for the day but I'll share more about that below. The show was a live telecast. There's a lot of stories to tell but I'll only share some of them. 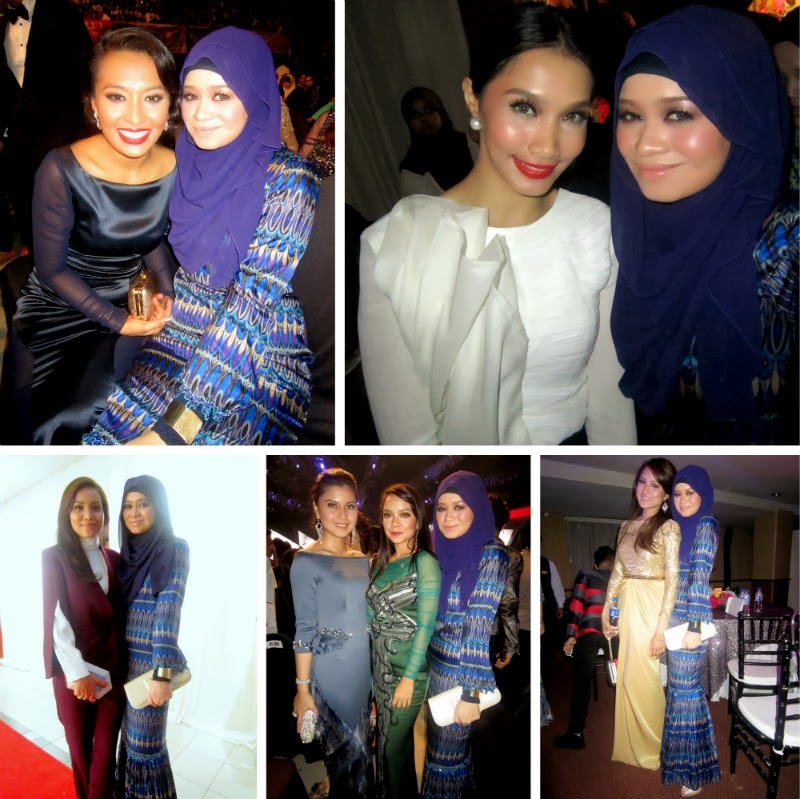 I met a lot of lovely and beautiful actresses at the event including my dear friend Lisa Surihani; cousin-in-law Nora Danish; my junior in high school Nadiyatul Nisaa; the super pretty Nur Fazura; Scha Alyahya, the famous celebrity blogger Hanis Zalikha; Nabila Huda, the one who won the best actress that night and the daughter of the singer of the song I always sing along to when I was little (Isabella), and also Maya Karin. They all sat nearby the place where we were seated which was Fasha Sandha and Yeop Rizal's seat. It all began when my cousin Yeop Rizal and cousin-in-law Fasha Sandha came to my house and asked me to go in their place. When they came over, Fasha initially just said that she needed a favour from me which was work-related and she wanted me to represent her to the event. She was nominated for a few categories and needed someone to attend just in case she won. She couldn't go because at that time Rayfal was due any time already. I remember I was very much hesitant to go due to my condition but I decided to go because they made all the effort to come to the house and personally sent the invitation cards and other passes to me. I was even more confident when my sisters Hasanah, Shereen & Fahima pushed me to go after consulting them, saying it was good for me to go and I then got to know that I would have friends going to the event. All in all, I'm glad I went because it was a unique experience, I must say. I don't know any other way to describe the whole experience. I remember Fasha and Yeop visited me several times in the hospital and brought home cooked food, flowers, fruits, and even gave me a portable DVD player with some DVDs to keep me entertained at the hospital (even though I only managed to watch only about 3 of the DVDs during the entire 78 days of my stay in the hospital). They were also at the hospital the day after I gave birth to Jibrael. They had been very kind to me during my trying times fighting and such kindness like that was not something I could ever repay. At that time, Fasha and Yeop were expecting Rayfal, who had just about the same estimated due date as Jibrael. As much as it wasn't an easy task for me to attend the event, after much persuasion from them I agreed to accept the honour of representing them. I remember Yeop, when trying to convince me to go, told us that we're the most suited to go because we are lawyers and our job amongst others is to represent people! That was quite funny and cheered me up. I remember the last time I met Lisa before this event was when she visited me at home during my confinement period about a week after I gave birth to Jibrael, she was one of the first few who came and she also visited me in the hospital with Mummy @ Aunty Mira when I was carrying Jibrael. 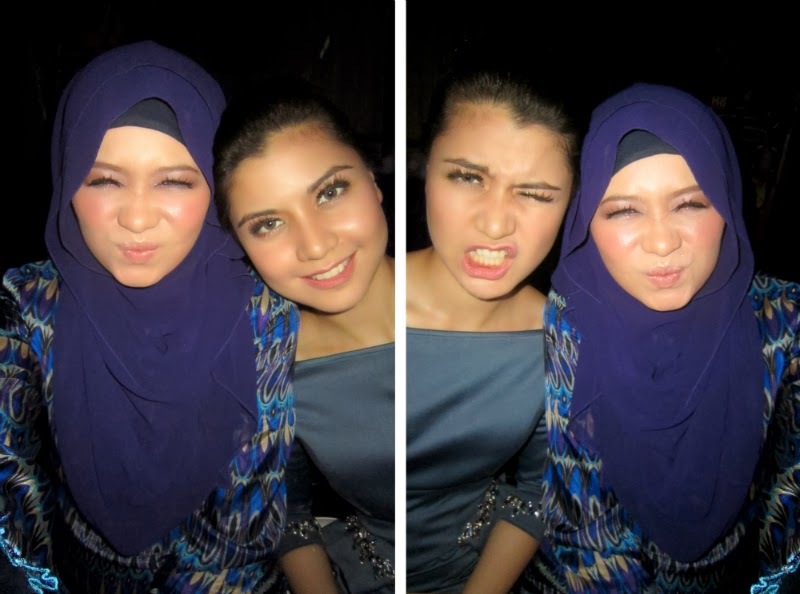 She is a true friend who was not just there during my happy times, she has also seen me and was there during my most trying times and I'm so touched by her kind gestures when I was unwell, and also throughout the whole event. The last time I met Nora before ABP too was when she and Aunty Sally visited me and Jibrael while we were in the hospital. She spent a few long hours chitchatting with me and catching up. I know they were both super busy with their work schedule but they all managed to spend some time off work to visit me and it really meant a lot to me. I'm glad that we sat near to each other at the show. I remember when I was in my initial stages of coping with my loss and when I was just trying to go out again to meet people this year, I am more comforted when I met people who had visited me at the hospital. I remember at that time everything that happened before I was admitted in the hospital last 1st November 2012 seemed so distant and a life time away, and people who didn't come to visit me at the hospital during my 78 days stay and also throughout my confinement period naturally became distant to me at that time. Or maybe I became distant to them. Unless it was meeting people who I've just met or never met before. I guess multiple traumas do that to you. Lisa being the beautiful kindhearted soul that she is, offered and insisted for me to get ready at her lovely crib before the event and suggested that we convoy together to the place of the event. Aunty Mira, Lisa's Mommy was so hospitable and made sure drinks and fruits were served for me and the husband while we were getting ready. Like mother, like daughter. 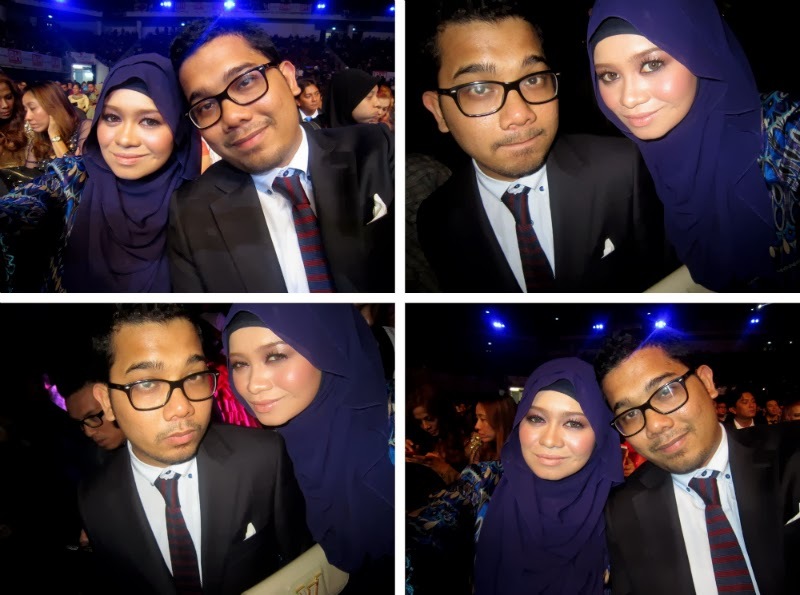 Both were such sweethearts, MasyaAllah. I was truly touched by the super warm and wonderful hospitality by Lisa and Aunty Mira at their home. Somehow talking to the kind Aunty Mira helped calmed my nerves. I also met Lisa's bubbly and cheerful cousin Muneera Shah at Lisa's house. We were late for the event but the husband managed to take a group photo of us before we left the house. Muneera then followed me and the husband in our car as we followed Lisa, Yusry and Aunty Mira from the back. When we arrived I was so happy to find out that my seat was just behind's Lisa's seat, and Nora was seated in front of her. Familiar faces, Alhamdulillah. Even though it was overwhelming for me, the fact that my husband was by my side the whole time and having these two people seating nearby really comforted me. We stole some time to take photos during commercial breaks which was also the time for us to chitchat. In my view of the stage I could see Fazura, Nora, Lisa, Neelofa and Maya Karin who sat a few seats in front of me. 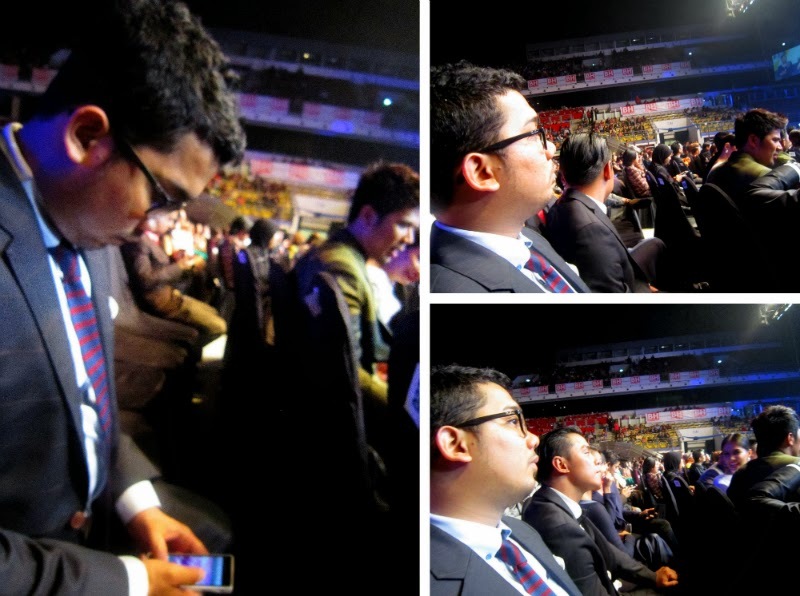 As you can see my date for the night, the husband, looked bored in some of the candid photos I took of him. As ever, he was watching live streaming of football and played games on his phone while the show was going on live television! I tried to tell him that the cameras could see, but he didn't care. That's my husband. Couldn't care less. Hehe. I feel so loved because he actually went through the whole event even though he had to miss watching a football match of his favourite team Tottenham Hotspur! That really meant something to me because as you know, guys who are really into football and their football team are like lovers really. But I'm so happy that he actually went to accompany me, I wouldn't have gone through it and actually do it without the husband. I have a confession that I have a girl crush on Fazura! She's so naturally beautiful and I was awed by her aura when i met her for photos a few times. Such a humble gorgeous lady. Picture taken by Nora who offered to take this photo right after the show. Anyway, I love the JM gown Lisa wore. She wore it so elegantly and it looked perfect on her. And I am not being biased at all!It was one of the standout dresses of the night and many agreed. Lisa, an extremely beautiful friend inside and out. Though she was naturally in the spotlight that night and was in the company of her colleagues and friends in the entertainment industry, she was always concerned and cared about me like no other. She kept asking if I was alright. Not many would understand my condition at that time while I was still trying to recover from multiple traumas and my difficulty of being in a crowded place with a lot of people but she did. She made me comfortable all night. Lisa is an awesome friend really. Praises God for the friendship. I wish I can be a great friend to her like she is to me. I wouldn't have made it through the event if she was not there to help me, right from the beginning until the end. Blessed to know this beautiful soul. I remember first meeting Lisa when I was one of the cheerleaders for the national inter-school cheer leading competition (Cheer 2000 or was it Cheer 2001? I remember Cheer 2000 was the first time the competition was held in Malaysia). Lisa was the face for Johnson & Johnson at that time. Memories so long ago, I can't remember it clearly. She went on and did her law degree and I think we only properly meet after she was done reading law in UK. Talking about cheerleading, it taught me so many things. Dedication, discipline, team work, confidence and leadership inter alia. Who would have thought right? It was also a fun sport. Oh, all those hours under the hot sun and practising till we have no energy left! Fun memories. I'm happy that most of us who shared the love for cheerleading at that time still remain close friends till today. Alhamdulillah. The last picture I took that night. The sweet couple Yusry & lady Yusry together with my husband Abdullah Khubayb just before he went to take the car. All in all, it was a great event, and allowed me to experience a once-in-a-life-time thing. I had an idea of what it was like to be a Malaysian celebrity, although I wasn't mobbed by a million adoring fans like Yusry and Lisa were when they tried to leave! Hahaha. Like I said earlier, it was definitely a UNIQUE experience. Takpe2... die bagi nasehak je boh. Niak doh baek. Dakwah bukan cara menghalalkan kekasaran... adakah perkataan bodoh bangang bahalol n tolol sesuai digunakan dlm berdakwah?? (Sila rujuk komen2 di post yg lain) fikiran terbuka xsesuai ngan nama tu... perkataan yg awk guna menunjukkan awk berfikiran tertutup, orthodox..